The Inflatable Bubble Ball Is Suitable For family gatherings, picnic, birthday parties, barbecue, on the beach, in the park, or in own backyard. It Could Make Fun When You Play With It With Your Friends Or Parents. And you'll fell like a bull when you put it on and don't worry about hurting yourself. Using Inflatable Bumper Ball, you can experience these unique fun Balls with families and friends. Whether it's a birthday party, stag/hen party or just come with your friends these are serious fun and will have you laughing just watching your friends fall over. Suitable for all the family, You can Play a variety of different games. ✿ Inflatable Wearable Bumper Balls are the perfect activity for all ages at any recreational event. Enjoy family-friendly fun at the beach, park or in the backyard. ✿ Constructed of heavy duty, durable, odorless, PVC vinyl that is heat sealed and quality tested. Bumper Balls are collapsible and compact for transport and easily inflate in minutes. ✿ Bubble Soccer Ball made by 0.8MM PVC material, non -toxic, colorless, tasteless. can be completely clean and reuse，lifespan up to 3-5 years.Recommended for kids age 8 and up. 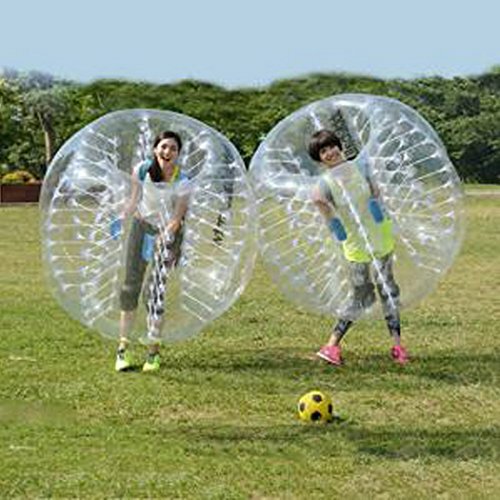 ✿ Knocker bubble soccer ball is suitable for schools, leisure centers, theme parks,party use,new &popular sports goods and so on.We are pleased to provide our latest products,designed specially to satisfy your needs. We assure you that our products are extremely cost-effective, user-friendly, eco-friendly in nature. Your satisfaction is our main priority.